The Scottish Government has agreed in principle plans to implement a nationwide ban on pavement parking. On 4 April, ministers voted to pass the Transport (Scotland) Bill to Stage 2 of the process – where MSPs will consider the details of the proposals and outline any amendments. The Bill, first first introduced by Derek Mackay MSP in June 2018, contains provisions to prohibit pavement parking – something which is not currently a specific offence in Scotland. It replaces existing laws on obstruction and pavement parking, which have been described by Living Streets Scotland as ‘unenforceable’. The charity has also welcomed the ruling, saying a ban on pavement parking will help to ‘create safer and more welcoming streets for all’. Stuart Hay, director of Living Streets Scotland, said: “The Bill will give new freedom to people in wheelchairs, parents with pushchairs and older people who are currently forced into oncoming traffic when they’re faced with a vehicle blocking their path. 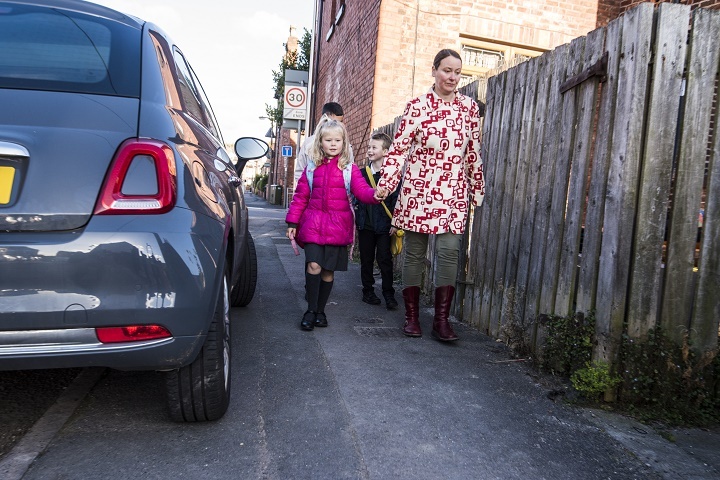 “A simple national ban which covers all pavements offers the best way to change behaviour and sends the message that parking on pavements is socially unacceptable. Will the rest of the UK follow suit? The Scottish ruling arrived in the same week that the Transport Committee launched an inquiry into pavement parking in England. The closing date to submit written evidence to the Transport Committee inquiry is 14 May. In a Scottish context the briefing paper states that it is already an offence to “Leave a vehicle in such a way as to cause an obstruction to other people – Road Traffic Regulation Act 1984, Section 99”. So it is somewhat surprising that a seemingly duplicative new regulation is required. The Briefing also makes it clear that any LHA will be able to exempt certain streets, presumably with signs to say so i.e. permitting pavement parking. The reality of this will be ugly streets with dashed white lines over the footway when the LHA determines that there is a parking need and the width is sufficient for a car or half car. This is something that most sensible users can determine without state intervention, and something that is already enforceable by virtue of current legislation. The Briefing also makes no mention of a far bigger problem of apron parking where a car overspills a private driveway across a bellmouth. Is this footway parking or not? Its certainly obstruction. All in all this Bill requires a lot more thought in my view. Banning pavement parking is a good step forward for the benefit of all proper pavement users. The Exec summary states The Transport Scotland bill would “Prohibit parking on the pavement, subject to a number of exemptions”. I look forward to Stage 2 to see a practical range of exemptions defined. Exemptions should be seen as practical measures to ensure a workable bill passes in to law. It is not a watering-down, as a total blanket ban only exists in the minds of ardent campaigners.